Toyota Land Cruiser Performance, Engine, Ride, Handling | What Car? 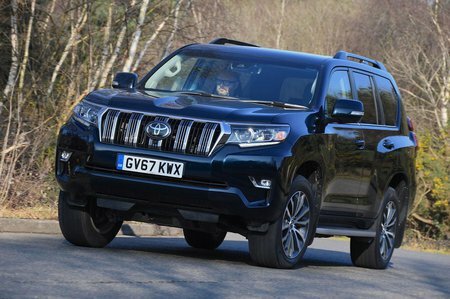 With a relatively large 2.8-litre diesel engine, you might expect the Land Cruiser to be quite sprightly; sadly, it’s not. That’s because, despite a reasonable 174bhp and healthy 332lb ft of torque (slightly less if you go for the manual model), it’s a comparatively heavy car. So, while some rivals with smaller engines – the Skoda Kodiaq 2.0 TDI 190 or Land Rover Discovery SD4, for example – can surge off the line or breeze up to a steady 70mph with seemingly little stress, the Land Cruiser requires more patience and a flurry of engine revs to achieve the same objective. Once you’re at 70mph, it’ll sit there quite happily, but the automatic gearbox (we haven’t yet tried the manual version) hunts between gears and, whatever speed you’re doing, it’s never the smoothest or most responsive. Another thing you will notice about the Land Cruiser is the amount of noise and vibration. Because it needs so many revs to make the most of its performance, you’ll hear plenty of clatter from the engine that simultaneously vibrates the steering wheel. Otherwise, the minimal tyre roar at motorway speeds is commendable, although you do get some wind noise from those large door mirrors. On the road, its ride and handling feel miles away from the latest brace of nimble SUVs. Drive a Kodiaq, Discovery or BMW X5 and you’ll be impressed by its decent dynamics. 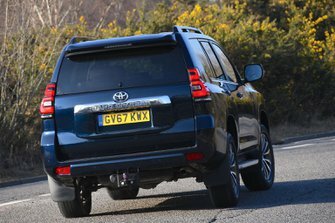 The Land Cruiser, on the other hand, is like the SUVs of old; its slow-witted steering lacks discernible feel, and there’s lots of body lean and little grip from the tyres when you push on down a twisting country road. Although the Land Cruiser has an old-school body-on-frame construction, its suspension is at least fairly modern and is slightly more forgiving now than it has been in the past. That said, it doesn’t come close to the low and high-speed comfort of a Discovery or Kodiaq. Range-topping Invincible models come with active anti-roll bars that are designed to help the Land Cruiser remain more upright through bends and lessen the impact of mid-corner bumps. In reality, on the road the Land Cruiser is never fun to drive. Invincible cars also get adaptive dampers and adjustable rear air suspension, the latter of which helps keep the car level when loaded up or when towing either manually or automatically. Off road, though, it’s a different matter. 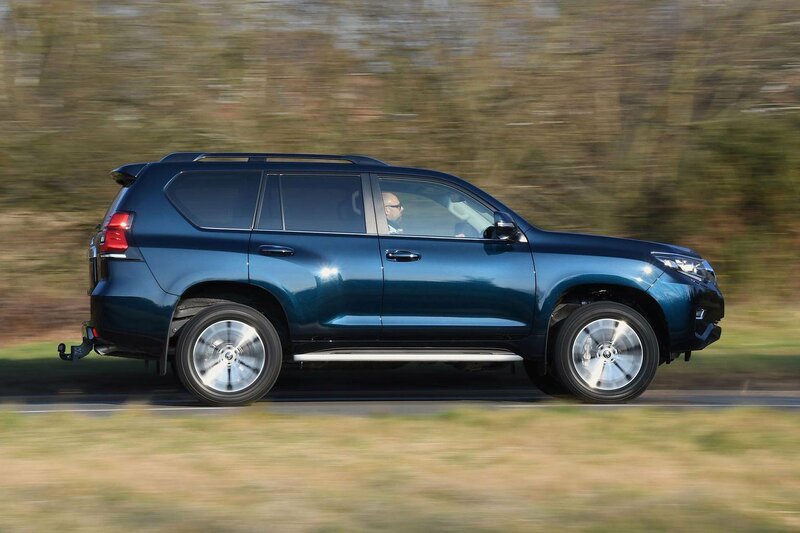 With full-time four-wheel drive, differential locks, low and high-range gear ratios and that adjustable rear ride height, the Land Cruiser really is a car that’ll go to places many SUVs can’t. An optional off-road pack (standard on Invicible trim) also brings multiple cameras for better visibility. And with a towing capacity of 3000kg, it’ll pull bigger loads than many of its rivals, too.